Gothic Revival’s early years in America truly merited the name. The styles that grew out of it looked Gothic. A person reading Pugin or Ruskin could see the connection. They were not exactly what was being built in England, but they had the same inspiration. I have failed to mention J.C. Loudon until now, but let me amend that. He becomes very important in the American story. In 1833 he published theAn Encyclopedia Of Cottage, Farm, And Villa Architecture And Furniture, Volume 1 and Volume 2. This book earned him two significant American disciples. Andrew Jackson Downing and Alexander Jackson Davis shared a middle name and an architectural practice. These two, in turn published their own books. Davis wrote Rural Residences in 1838 and Downing’s Cottage Residences came out in 1841. He followed that up with The Architecture of Country Houses in 1850. 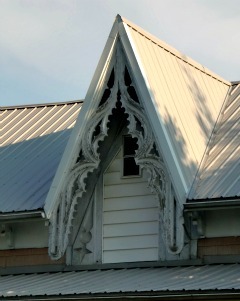 The Gothic Revival houses they created, and the style that developed from their pattern books is now called Carpenter Gothic. Since in America wood was the dominant building material, that is what they focused on. Downing was particularly taken with the Swiss chalet, and gave his houses small second story balconies and a decorative cut bargeboard. The bargeboard was not necessarily cut to a standard pattern. The scroll cuts were to give the house individuality, what the people of that day called “character”. Houses that Downing and Davis designed, or which were pulled straight from their patterns, still dot the countryside. British-born architect Richard Upjohn also published an influential Gothic Revival book of plans Rural Architecture (1852) in which he introduced the British Gothic villa to America. These early Gothic Revival houses never fully died out. They kept being built, but at the upper end of the market the style started to alter, and in a way that Pugin probably would not have appreciated. One of the values of Gothic architecture was a belief in the importance of the craftsman in the construction of beautiful buildings. The return to Gothic was supposed to bring with it a return of the trade guilds as a counterweight to the mass-production of cheap goods. Pugin and a host of others brought the designs of the cathedrals back into fashion and expected the ornamentation to be reproduced by skilled craftsmen. This happened, in part, but the ideas of mass production were just too strong. Gothic designs could also be mass produced, and they were. While a lot of this happened with internal decorations and furnishings, and it happened in both England and the United States, its impact on the exterior is critical to our story of Gothic in America. It started with the scroll-cut bargeboard. While not exactly mass produced, this was a cheapening of the craftsman ethic. It did not require a skilled tradesman to make this cut. It was an everyman’s decoration. Building in wood was its own assault on this ethic. While carpentry was a skill, the opportunities for excellent craftsmen to display their skill was somewhat lessened as compared to building in brick and stone as was common in Europe. The spindle, that mainstay of the Eastlake style of house design, could be produced ever-so-cheaply when steam engine drove the lathes. Likewise the shingle of the Queen Anne, no matter the pattern, could be spit out by the thousands. These two items came to dominate the exterior of Victorian houses in America. Charles Eastlake himself, in a remark about the Victorian Britain of his day, in his Hints on Household Taste decried the use of cast iron on door hardware when wrought iron items could be “bought of the many medieval metal-workers whose branch of art has now become a recognized institution in this country.” Cast iron could be mass produced, but to create the same design out of wrought iron took skill and time. This cheapening of the revivalist ethic soon had its toll on the outward form. The next big thing was a peculiar type of house later to become known as a Stick house, and which for a time carried the Eastlake name. Shortly after that the Queen Anne appeared. Together they had the effect of taking the Gothic out of Gothic Revival.